I am not sure whether, this is the traditional recipe for making bengan bartha, but I named it so, because it is made out of brinjal(!) I used the left over brinjal masala curry to make this recipe. Salt - required amount for ingredients 2,3 and 4. First grind, tomato, onion and green chillies adding required amount of salt into a fine paste. 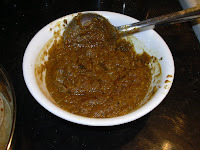 Now add the the masala curry to it and grind it again so that everything mix well. Pre heat unsalted butter in a pan, add the grounded paste and cook it well for 5 to 7 mts adding required amount of water. Garnish it with coriander leaves. We can also add a handfull of peas to it. First cook the peas and add it to the grounded paste while cooking with butter. However you made it..its looking yummy..
variety of brinjal recipes!They look yummy. 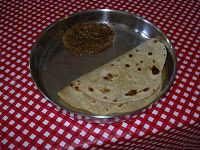 first time to ur blog...its really looking yum and delicious..
wow something new and looks gr8.